As we aggressively implement strategies towards 100% carbon-free energy and witness a greater proliferation of renewable energy infrastructures in our cities and landscapes, we have an opportunity to proactively address the aesthetic influence of these new machines through the lenses of planning, urban design, community benefit, and creative placemaking. Please join the Land Art Generator Initiative, Creative Carbon Scotland, SCENE Consulting, and ecoartscotland for a presentation and discussion about the aesthetic and cultural implications and the concomitant potential for community benefit of renewable energy infrastructure. LAGI Founding Directors Elizabeth Monoian and Robert Ferry will speak about the LAGI 2016 Open Competition and the LAGI Glasgow project, highlighting the role that creatives are playing in the design of our energy futures. The Land Art Generator Initiative (LAGI) brings together artists, architects, scientists, landscape architects, engineers, and others in a first of its kind collaboration. 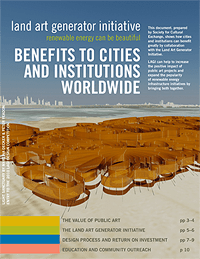 The goal of the Land Art Generator Initiative is to see to the design and construction of public art installations that uniquely combine aesthetics with utility-scale clean energy generation. The works will serve to inspire and educate while they provide renewable power to thousands of homes around the world. This entry was posted on November 2, 2015 at 8:30 am and is filed under Artists, Knowledge, News, Research. You can follow any responses to this entry through the RSS 2.0 feed. You can leave a response, or trackback from your own site. Land Art Generator Initiative are on of the world’s leading arts organisations engaging in energy issues – this talk in Edinburgh later this November is unmissable for anyone interested in developing work in the arts and energy space.